One of the finished trusses temporarily mounted on the piers. 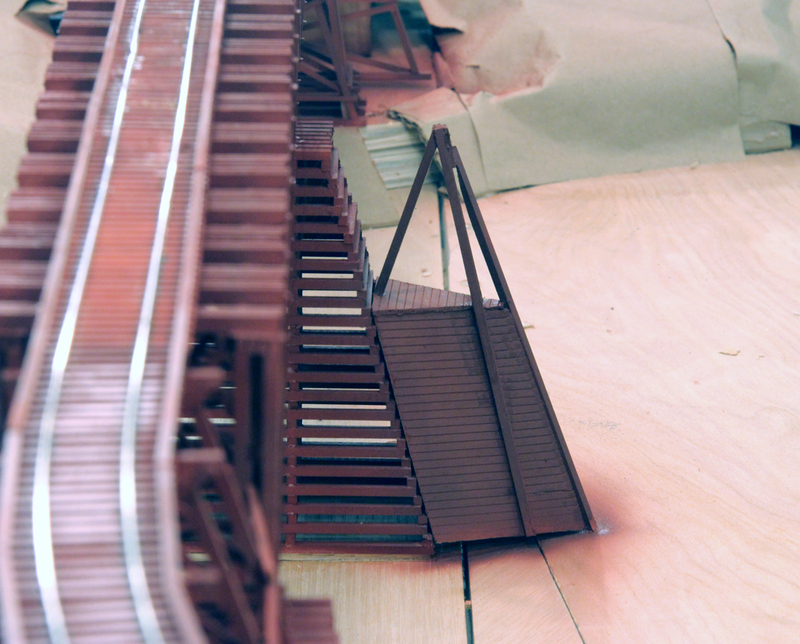 The finished bridge will be assembled on the layout. The last few weeks have again been hectic with traveling to various events. The annual Virginia & Truckee RR Historical Society was held in Carson City Nevada at the first of October and was great as usual. 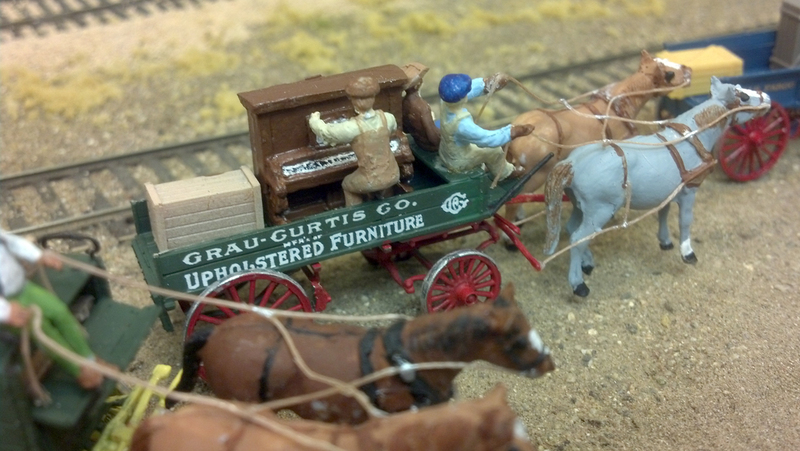 It's the only place that I know where several early railroaders, both modelers and historians, gather. If you aren't a member, take a look at their website (www.vtrrhs.org). The society has a great quarterly magazine and publishes at least one book on the V&T each year. When I finally ended up at home, I decided to start construction on the Stanislaus River Bridge. 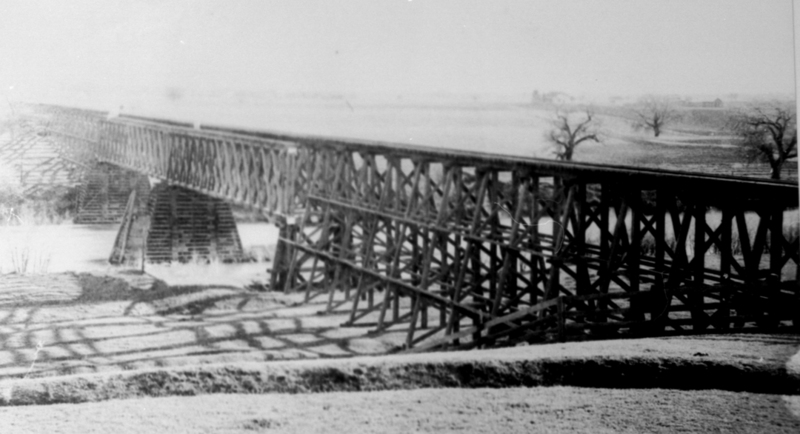 This bridge was built in 1871 and allowed the S&C to enter Oakdale. 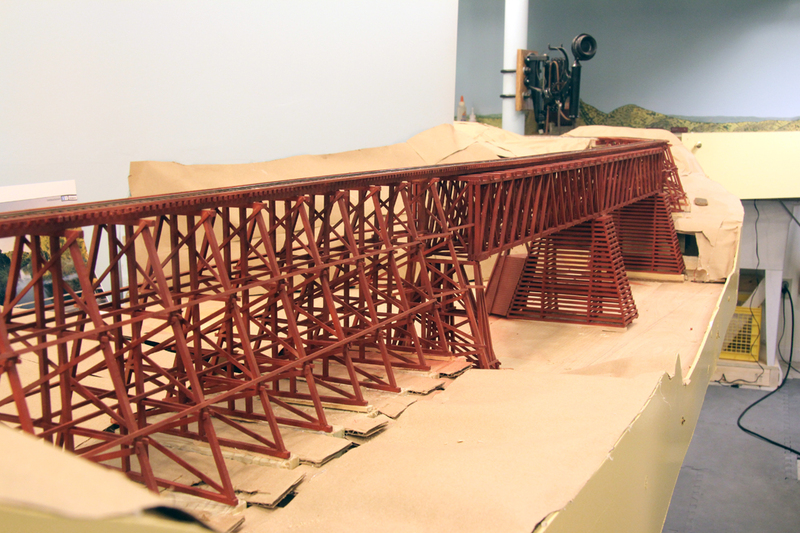 It had two 140-foot wood Howe Truss bridges and several hundred feet of approach trestle. 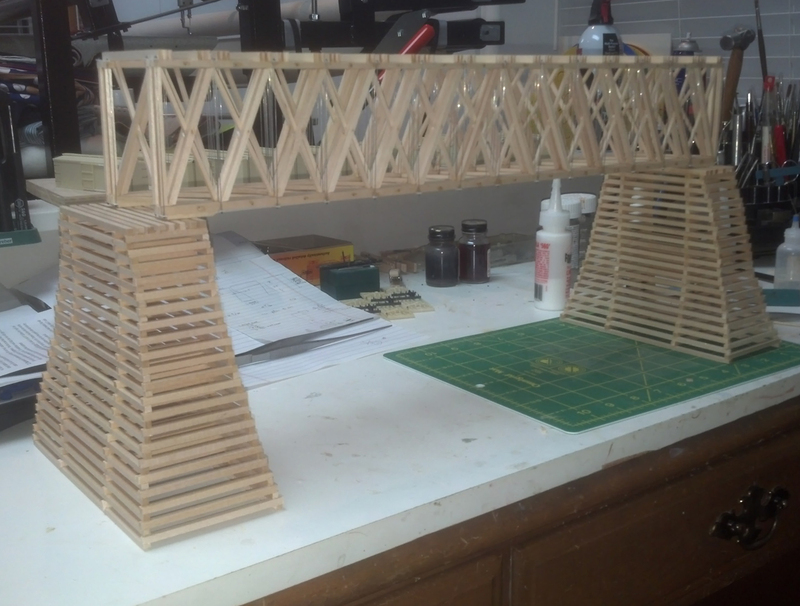 In amongst all the other things, I started on the two Howe trusses and managed to get them finished. It was not difficult work, just tedious. I started by making a jig so that the four sides needed would match and started cutting and gluing stripwood together. Making the metal tension rods took a little bit longer. castings cored .020 inches were used for the nuts at either end of the tension rod. 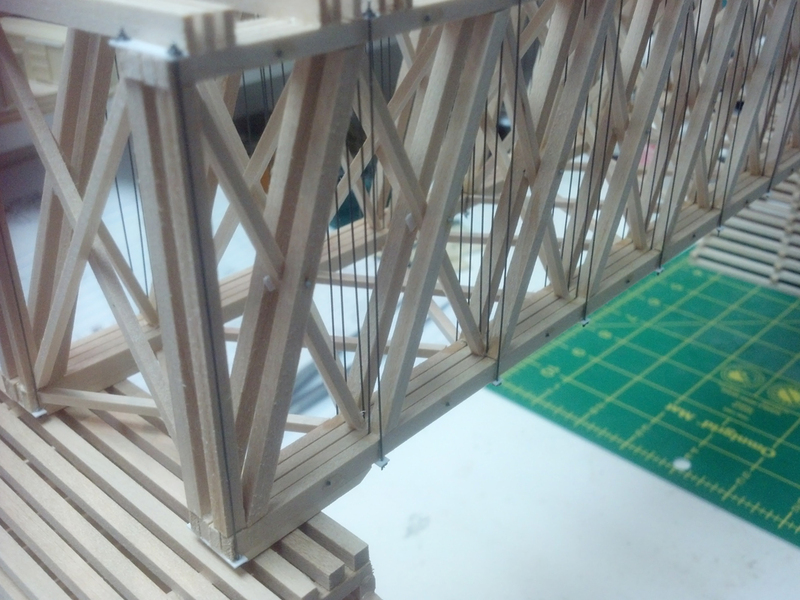 When the truss bridges were done, I started on the wood piers but then ran out of wood. 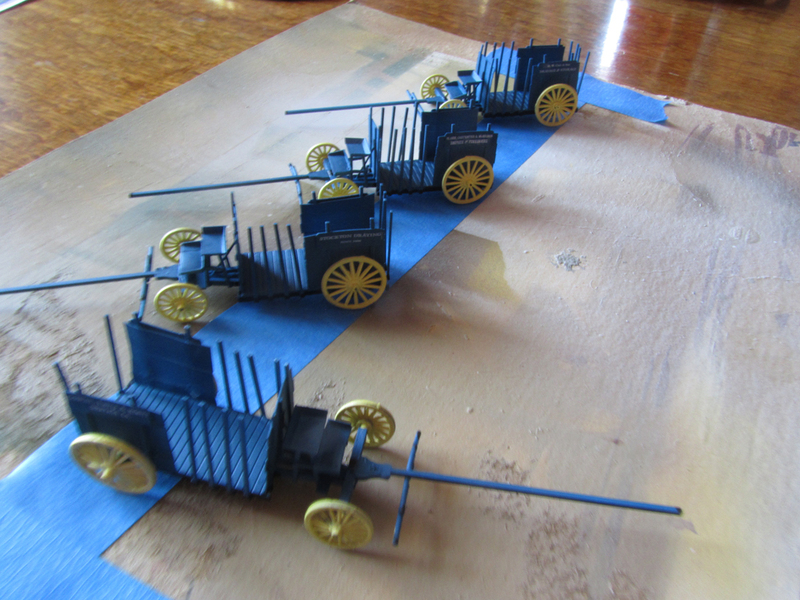 I ordered a huge supply and, while waiting for it, started work on some Silver Crash Car Works boxcars. These are 28-foot cars and follow a Southern Pacific prototype, just perfect for the S&C. I purchased 20 of these a few years back and am just now getting to them. 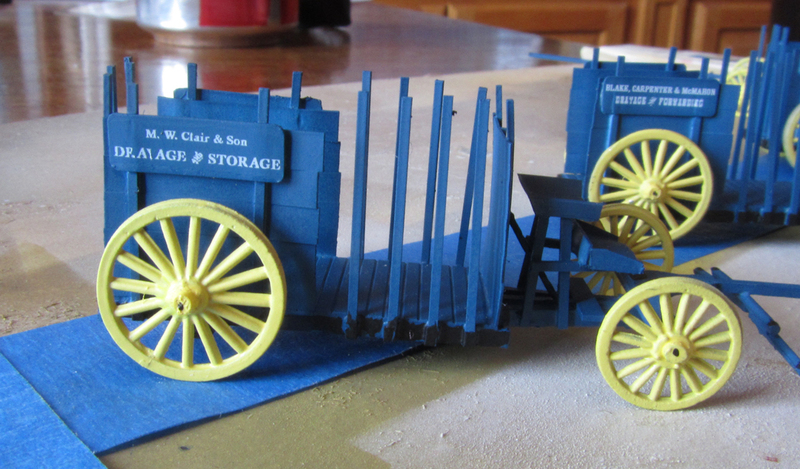 These managed to get finished except for paint. I'm waiting for the trucks to come in so I can paint everything together. This was not a great setback since the wood arrived in the interim. This allowed me to finish the two piers (the third pier is trestlework). 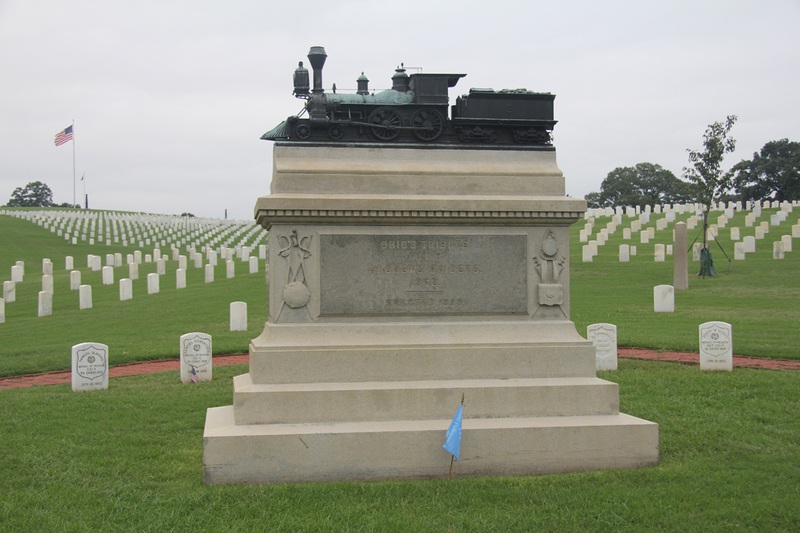 expediter arrangement between the Central Pacific, SP, Union Pacific, C&NW and Rock Island. The jig for the trestles has been made so I will probably start putting the bents together next. More later after the paint arrives and/or the bents get built. 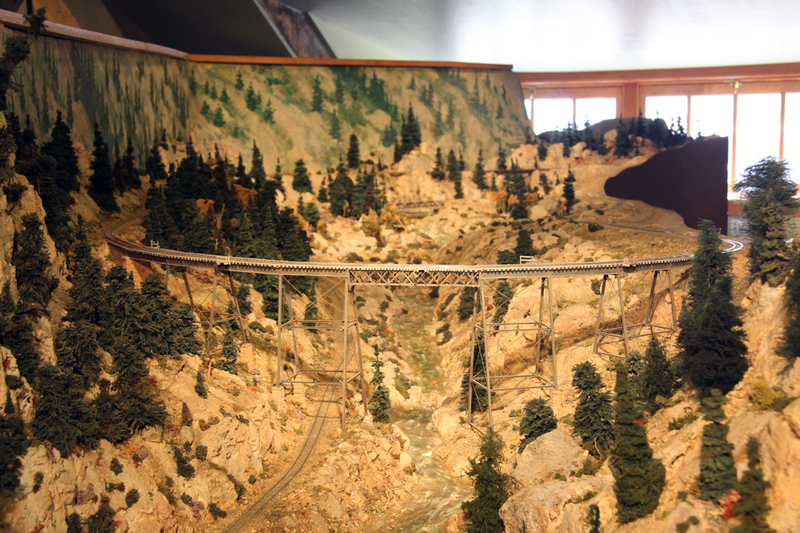 Harry Brunk's model of the Georgetown Loop on his UC&N RR in Cheyenne. Platforms allowing viewing from different angles. Over the last week, my wife and I have been in Colorado. Quilt Colorado, an annual was being held in Longmont this year so we decided to go. I told her that I could probably find something to do while she was enjoying her convention. As it turned out, I found a lot to do. 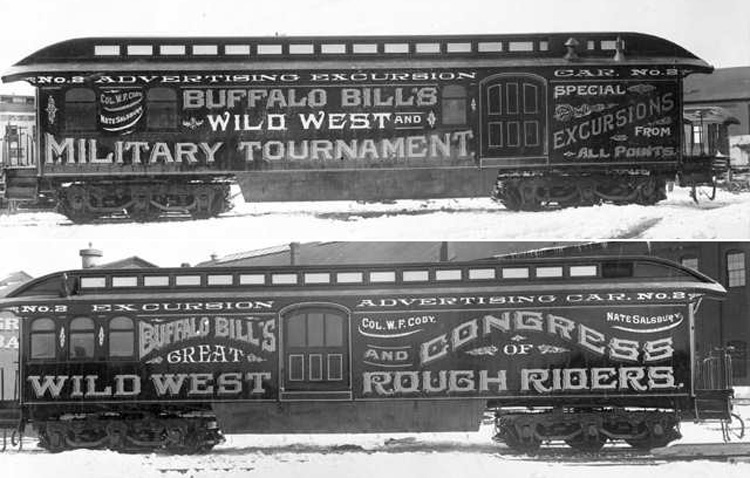 The first day I traveled up to Cheyenne, Wyoming where Harry Brunk's fabulous Union Central & Northern Railroad now resides. It is on a second floor of the old Union Pacific depot and is being nicely restored. If anybody is not familiar with the UC&N, the books Up Clear Creek on the Narrow Gauge 1 and 2 can provide you with plenty of material to digest. The layout was removed from the trailer in which it lived and was spread out with larger aisles and additional sections being added. 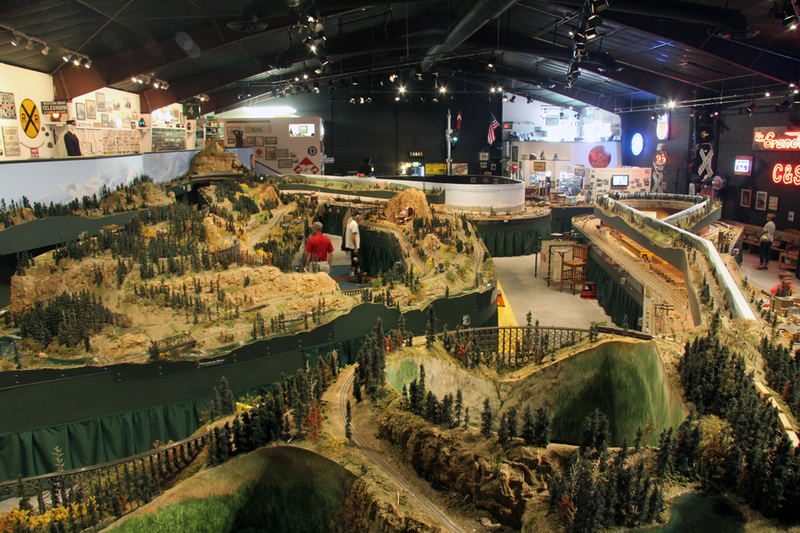 Eventually, the railroad will extend all the way down to Golden including a Beaver Brook scene. I was told that Harry comes up to Cheyenne occasionally to help out with the work. It was really great for me to see a railroad whose construction I have followed for the last 20-30 years. railroad which occupies about 5,500 square feet. I am a little skeptical of museum type layouts but this one was done to a high standard complete with mini-scenes and very realistic scenery, bridges and rolling stock. There is a "club" which consists of volunteers who run the museum and explain things to the public. They also get to operate the railroad on certain days of the month. Set in 1975, the railroad can accommodate 85-car trains. It's worth a visit if you are in the area. 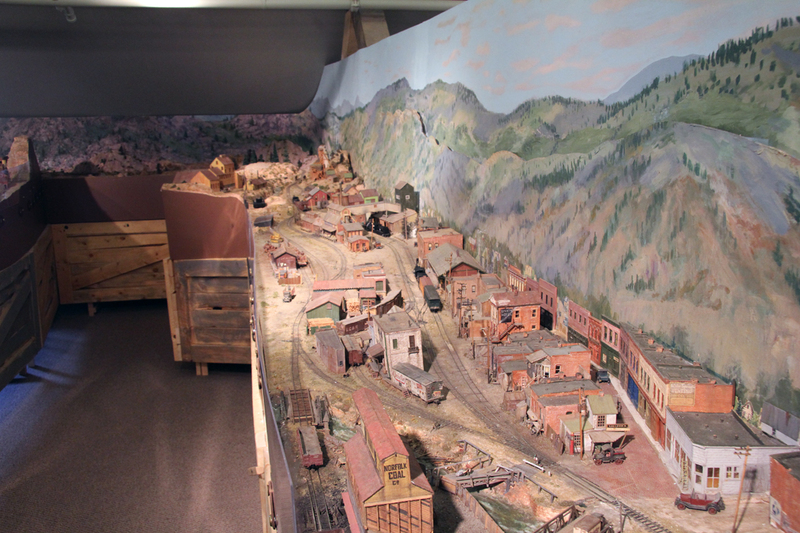 An overall view of the Oregon Central & Eastern, the freelanced railroad in the Greeley Freight Station Museum. The next day I journeyed to Colorado Springs and visited some of the Colorado Midland and D&RG related sites. Visiting Palmer Lake was something I had wanted to do for some time. I was also able to get some photos of some structures which might find a place on the S&C. All in all, I did manage to find something to do. The Calaveras on its first day of work. The number on the headlight lens is so that opposing engineers can tell which engine they are meeting if it is dark. As I mentioned in my last post, there was another engine in the works named Calaveras. This is for the county of that name in which Milton and Copperopolis are located. For Engine No. 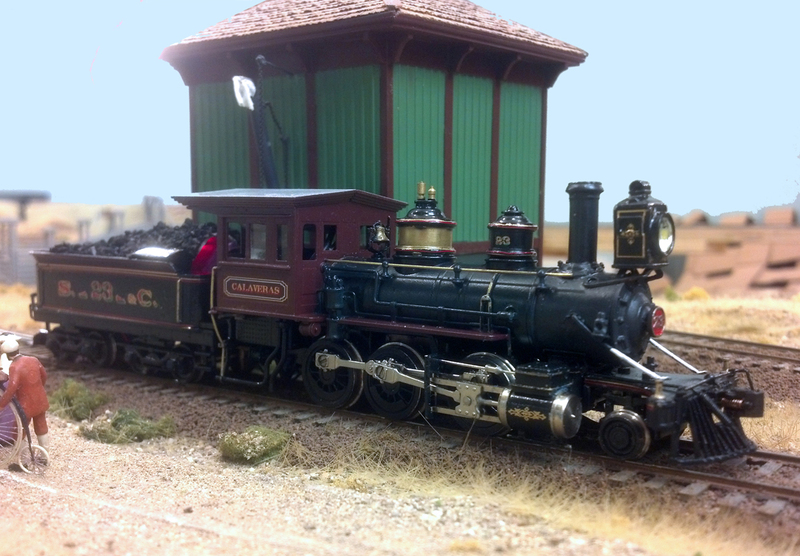 23, I decided to build a loco which had been order in the 1870s but had been updated in the 1890s. 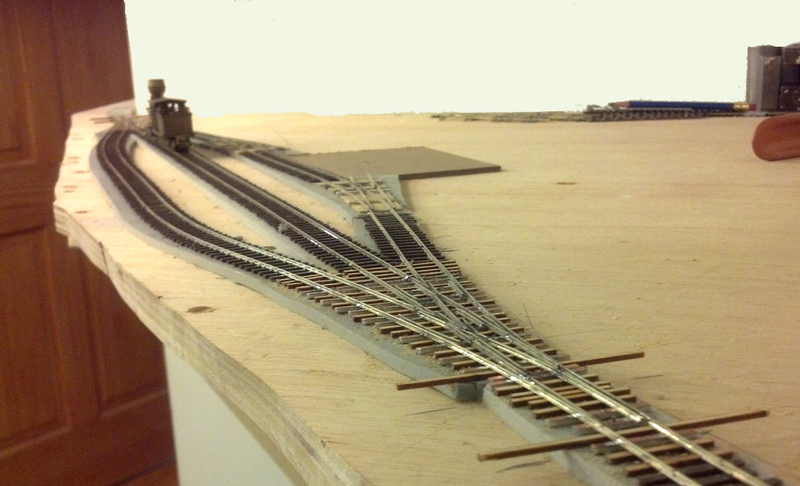 To do this, I used another of the Model Engineering Works V&T moguls and replaced the smokestack with a capped stack. The engine already had the extended smokebox (which followed the prototype which went through this conversion) so this was easy. After it was remotored, I painted the loco a Brunswick Green which I hope is similar to the color used by Baldwin in that period. The lettering is based on Southern Pacific lettering styles of the late 1880s-90s using a multi-colored three-dimensional approach. I still have to add some jewels to the classification lamps but that will be done shortly. Almost all of the S&C freight locomotives carry a wire rope cable for use in emergencies. The newly wiped down Stanislaus waits patiently at Oakdale for the day's work to begin. After a month of working on it, the Stanislaus, No. 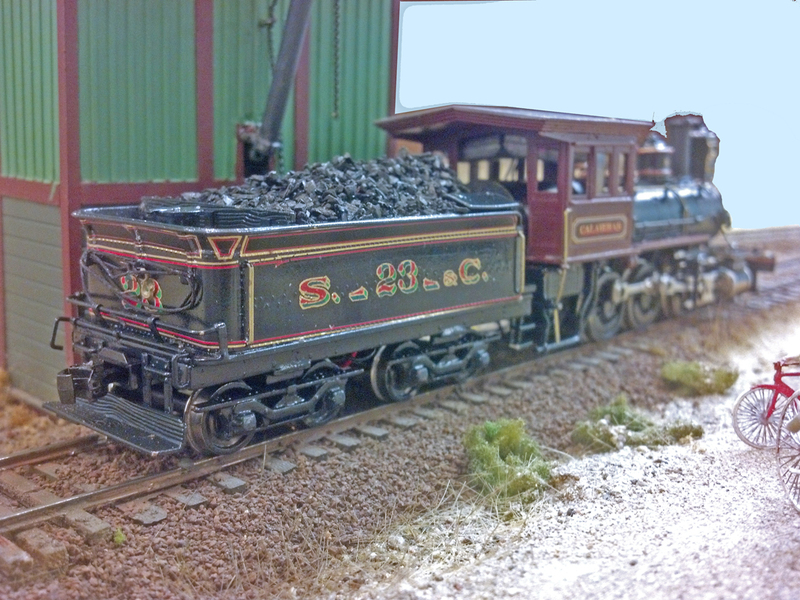 29, has joined the locomotive roster on the Stockton & Copperopolis. 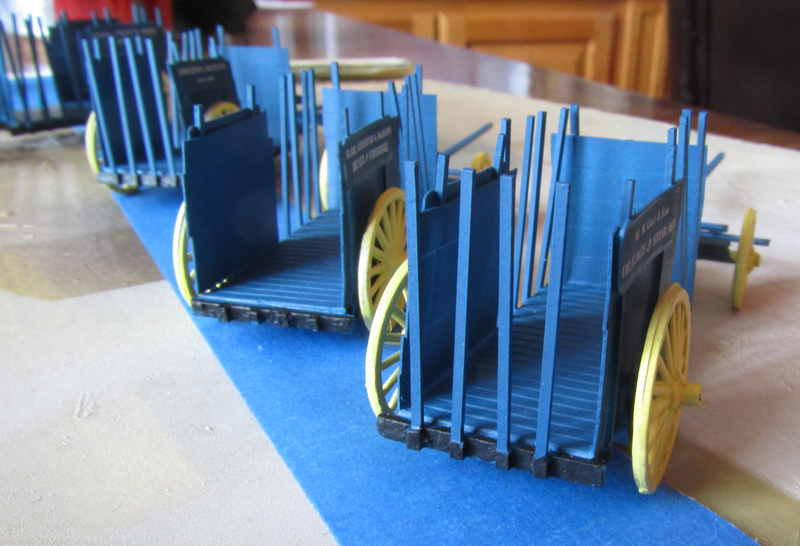 I had been waiting for a couple of new brass imports to come in but it finally became evident that they weren't going to show up.This prompted me to come up with two more engines from other sources. The Stanislaus is the first of the two. Both are based on Model Engineering Works imports of the Virginia and Truckee's number 20, the Tahoe. 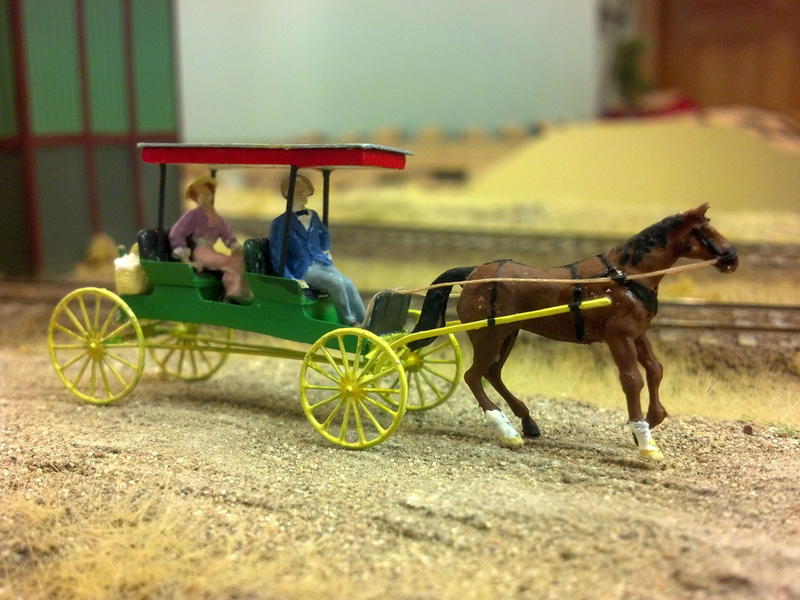 When the model was originally imported, it was based on the Tahoe as it now exists in Pennsylvania's railroad museum at Strasburg. It has an extended smokebox resulting from a conversion to coal as its fuel but is fitted with a balloon stack. I decided to cut off the excess smokebox to convert it back to its original appearance. While doing this, I also decided to give it a Radley-Hunter smokestack. Both the traditional balloon stack and the Radley-Hunter were suitable for wood-burners. A 16x20 can motor was substituted as well. A wood load for the tender hides the Tsunami decoder. Due to the configuration of the tender, the best place for the Tsunami TSU-750 decoder was in the fuel bunker. This was covered with wood to help disguise the decoder. A sugar cube speaker was used in the tender. 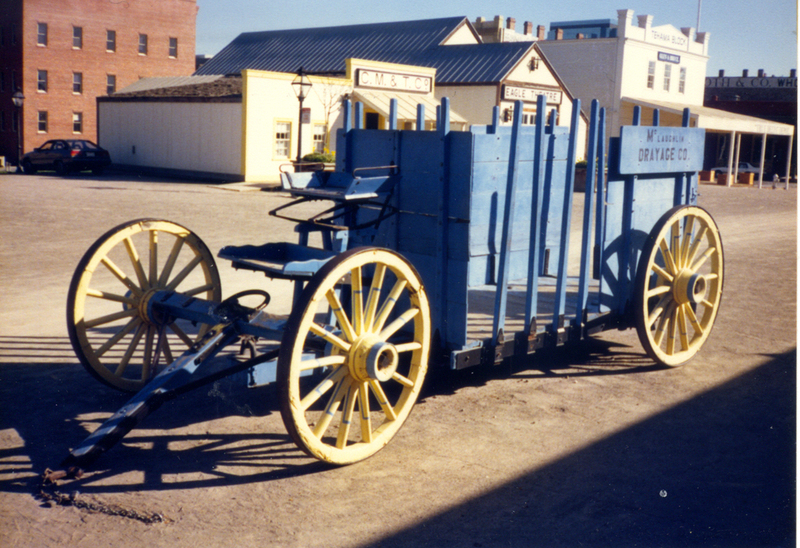 The painting and lettering was based on the original Baldwin paint scheme for the Tahoe. Readers of my other posts may notice that the name Stanislaus appears frequently. This is one of the counties through which the S&C operates and where Oakdale is located. The next engine should go together a bit more quickly. It will represent a similar mogul which has been converted to burn coal and repainted in a paint scheme more typical of the late 1880s. 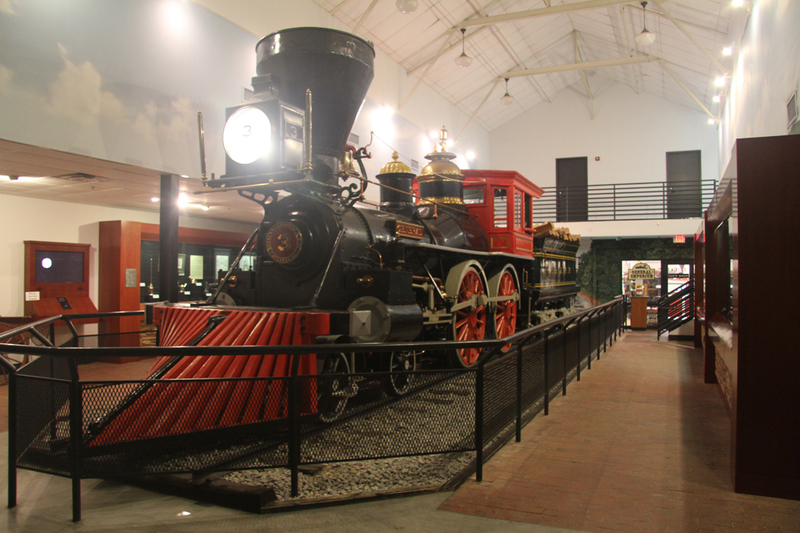 It will be named Calaveras for another of the counties in which the railroad runs. Tacked onto the tail of the Capitol Flyer is the Argonaut en route to Milton. The leaded glass windows are decals applied to clear styrene windows. 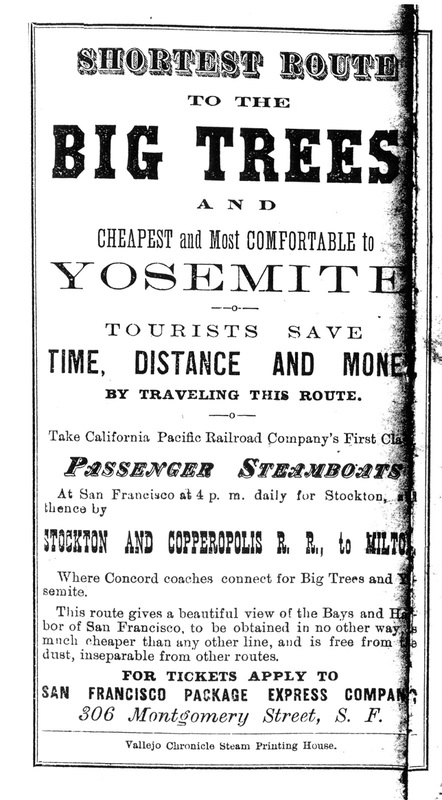 When someone wanted to travel to the Yosemite Valley in the 1800s, the average person would leave San Francisco at 4:00 p.m. on the Stockton steamer. By 7:00 a.m. the next morning, he was on the S&C train to Milton where he board a stage. He changed stages at Chinese Camp, stayed overnight at Garote and then transferred to a pack train and was in the Valley by 2:00 p.m. the next day. Only a two-day trip! If you had a lot more money, you had your private switch to the S&C train, left it at Milton and then took the stage/pack train. Old-timers said there was always a private car or two at Milton awaiting the return of their owners. To simulate this on my model Stockton & Copperopolis, a few private cars were needed. Well, at least one. 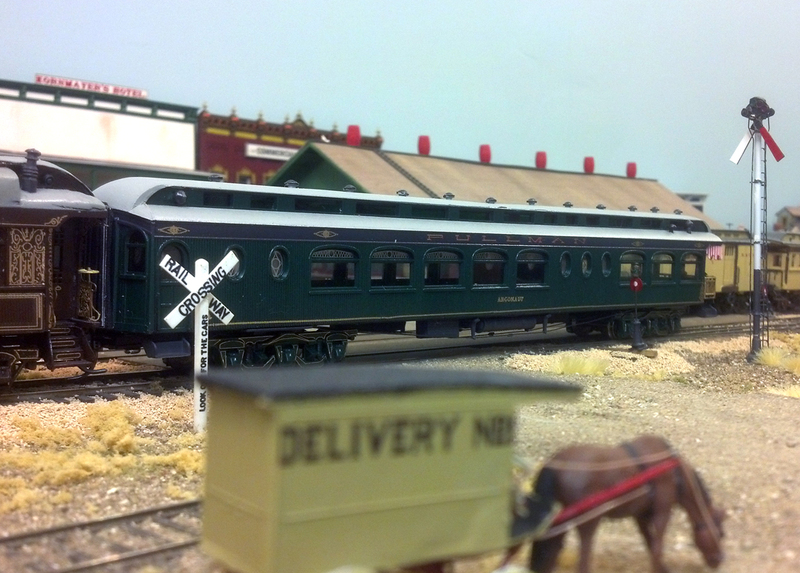 A couple of weeks ago, a visiting operator left me with a Model Die Casting Palace observation car kit. Since I had no other big projects in mind, I put the kit together, made up some lettering and here is the result, ready to be pulled to Milton so its owner can sojourn in the fabulous Yosemite Valley. The Argonaut blocks F Street while its owner gets a newspaper from the depot. The rear platform awning is paper glued to the car end. Looking down one of the aisles on the S&C. Farmington lies in the distance with Peters at the left. 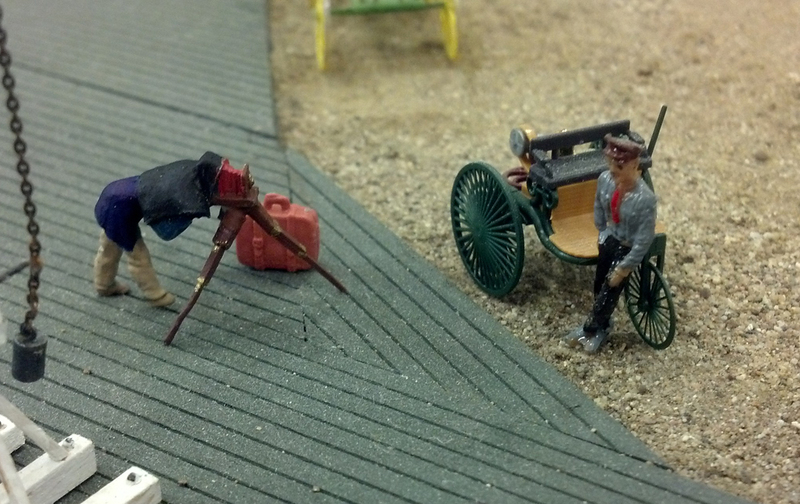 Recently, a friend of mine and reader of this blog told me that he would love to see overall shots of the railroad rather than just closeups of individual scenes. While I like photos that look prototypical, I can understand his request. We all live in the real world and, after all, the Stockton & Copperopolis is a model railroad so I decided to take a few shots of what the layout looked like to we real people. The photos were taken to produce a sort of mile-by-mile picture of what we are building. Just click on the link right under the title photo above or click here. When I have some more scenery, I hope to produce some stereo cards just as they might have done in the 1800s. That's in the future for now, though. I hope you enjoy the tour. 0-6-4T while this engine is modeled after the DSP&P's 2-6-6Ts. Late Monday night, rails of the Stockton & Ione line finally reached our bustling city and the shrieking of railroad whistles filled the night air. 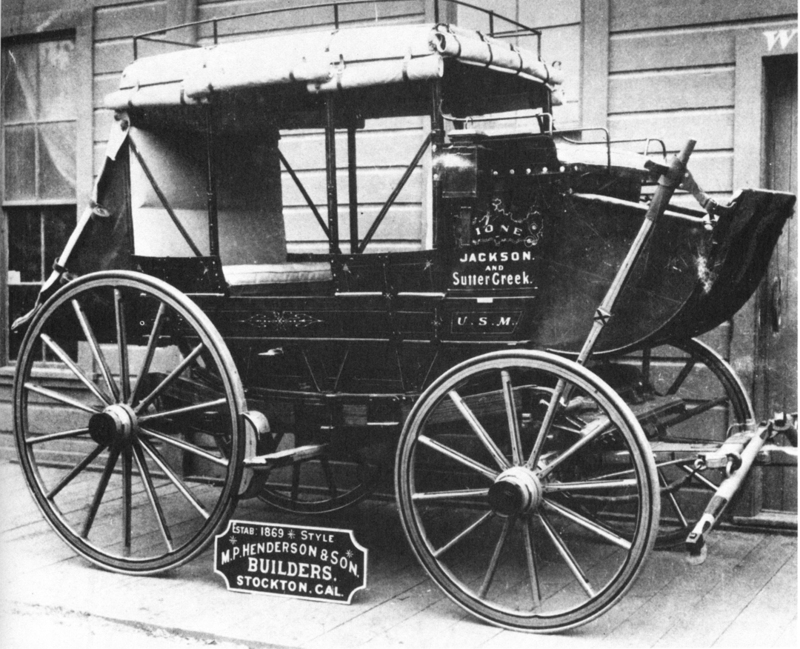 Our railroad connection to Stockton and the outside world has arrived. Another way to put would be that I spent a couple of days finishing the trackwork from what I've been calling Forbe's Crossing to Ione. 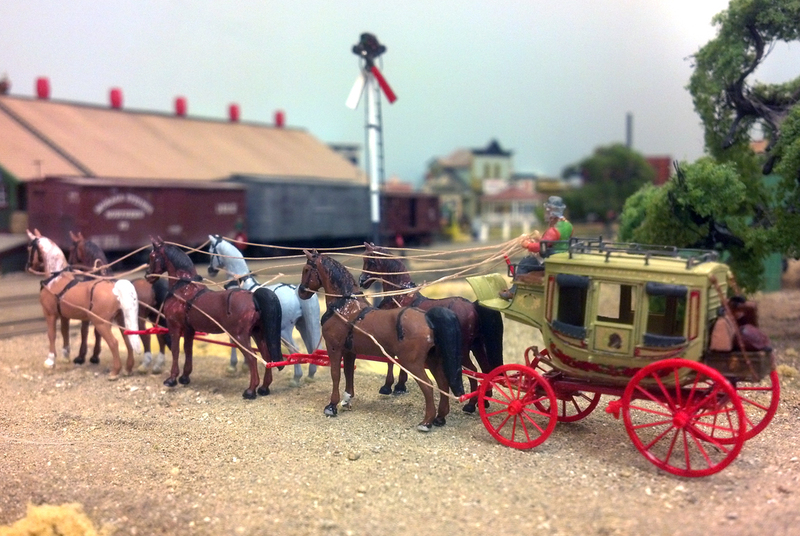 There's still no wiring; I'm working out any inaccuracies in the turnouts and I had to get things cleaned up for Prairie Rail 2014 which is occurring in Kansas City this weekend. 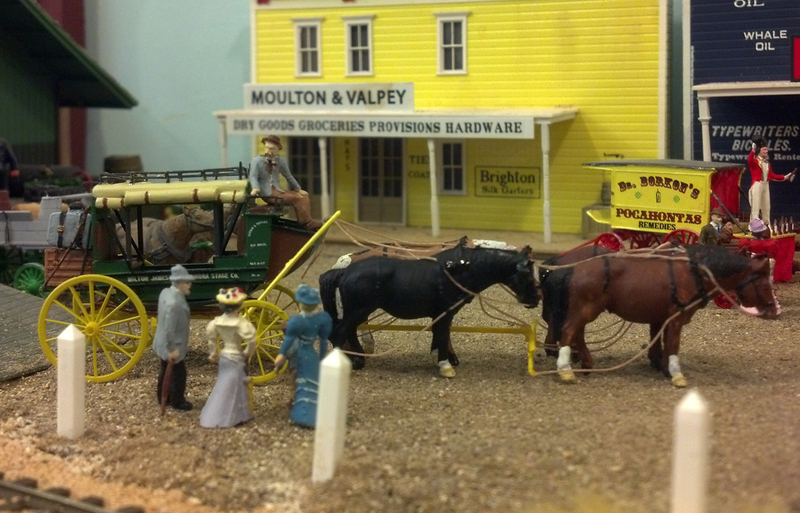 Prairie Rail is an invitational bi-annual model railroad operations weekend. 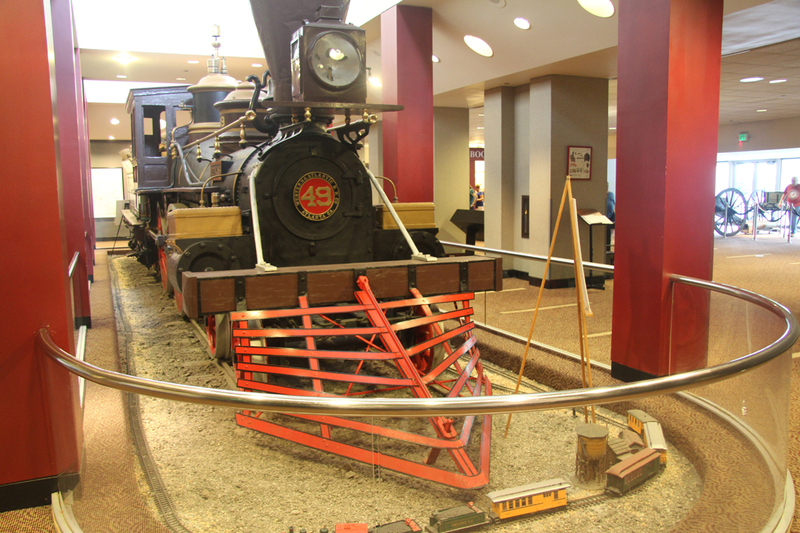 This coming February 21-23, about 120 model railroaders from all over the country are converging on the Kansas City area, each to spend time operating on four of the 29 model railroads participating in the event. 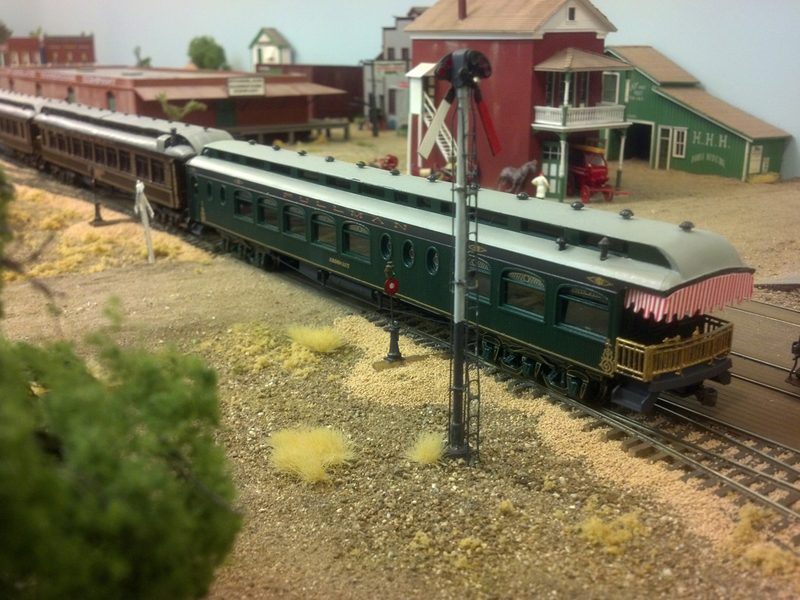 The S&C will be hosting two three-hour operating sessions during the weekend as will the other model railroads. We've done this before and it's a lot of fun meeting folks from out of state and getting to know them. Not all of the work you see in the photos was done in the two days I mention, however. The four turnouts, two of which are 3-ways, were built several weeks ago and were just waiting to be installed. 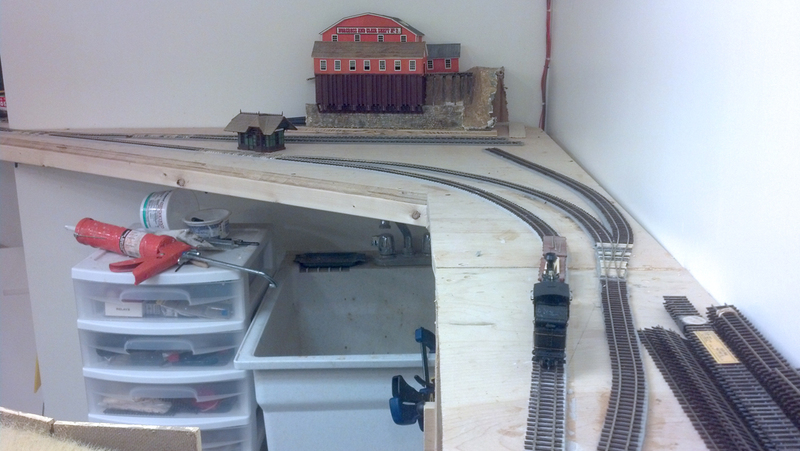 After Prairie Rail is over and I catch up on some of the things around the house that I have been putting off until after Prairie Rail, I can get back and get the track wired. 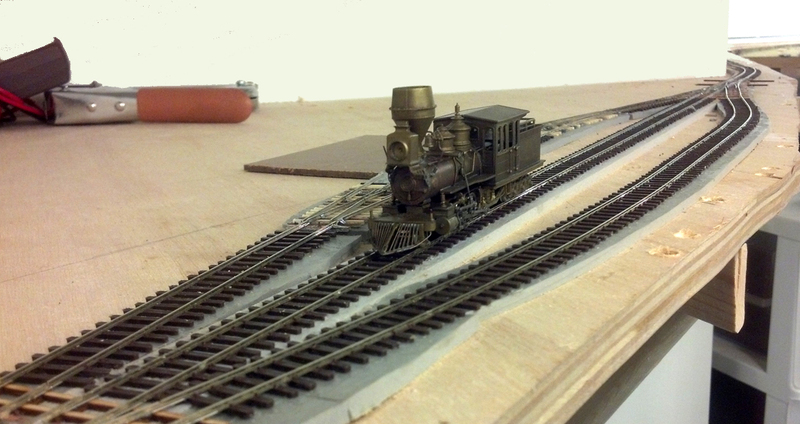 After that, I will have to get serious about getting some locomotives built or modified. Looking north at the small Ione yard. A diamond has to be built so that the industrial sidings can access a couple of businesses but most of the area will be the townsite. 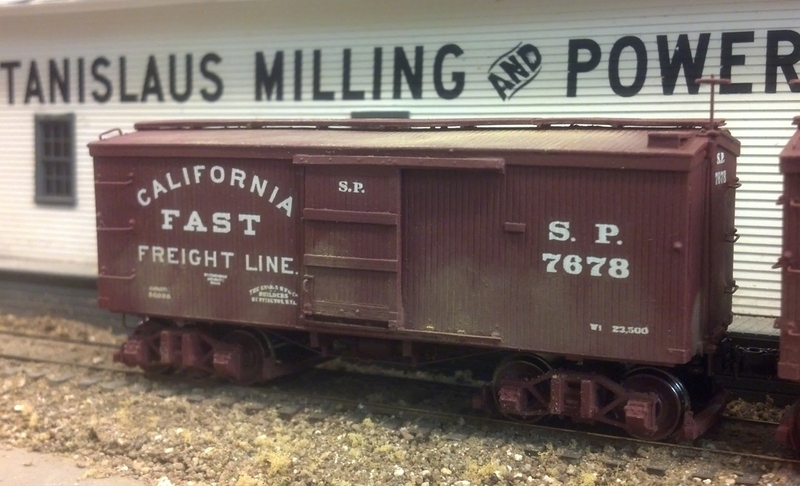 A Stockton & Ione work train pushes flat cars with track-laying supplies near the new depot. The Amador Coal Company is at the left. 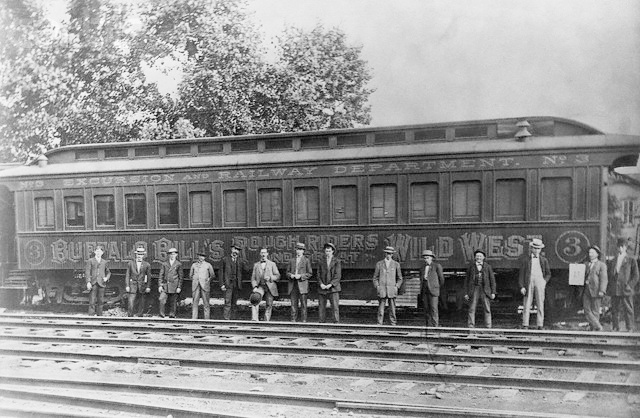 In a flurry of activity, track crews of the narrow-gauge Stockton & Ione Railroad laid track from its junction with the Stockton & Copperopolis to Forbes Crossing. 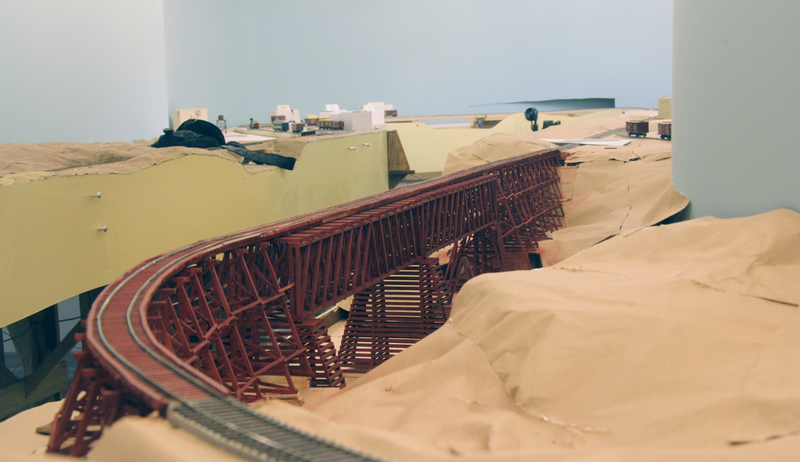 Officials of the railroad expect that trains will be running to Ione City by September. Well, the above is not really from the Stockton Daily Independent but it shows that some work has been done and engines have been run over the track, after a fashion anyway. There is no wiring as yet but jumper cords do wonders. As a short feeder line for the S&C, the S&I won't be much of a railroad but more of a switching line. 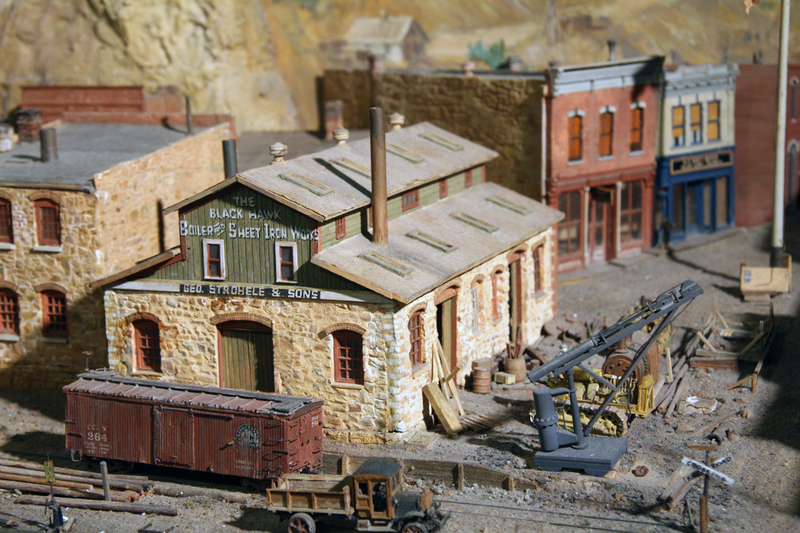 Forbes Crossing will be a small town with a coal mine run by Amador Coal and served by the railroad. A short team track will be the only other track there. 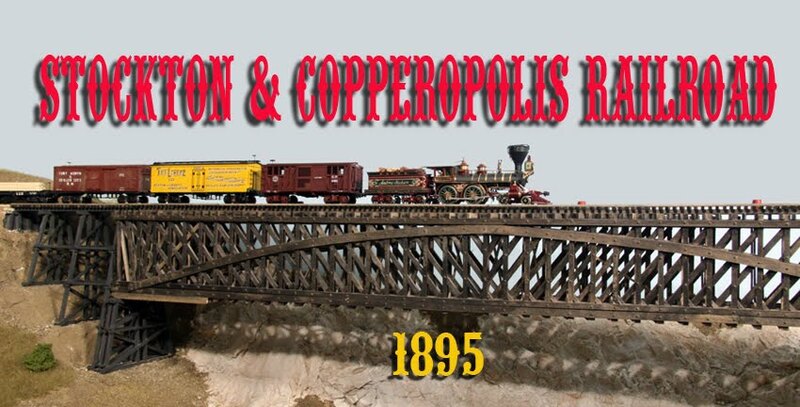 The reason for this new construction is that the National Narrow Gauge Convention is coming to Kansas City this September and the Stockton & Copperopolis has been asked to be on the layout tours. I figured that there should be some narrow gauge trains running even if there are not very many. The S&I leaves 3-rail track at the far right, passes through "Forbes Crossing" and will continue to the left. Looking from the junction, the whole of "Forbes Crossing" is seen. The team track is at the right with the Amador Coal-to-be building at the rear. 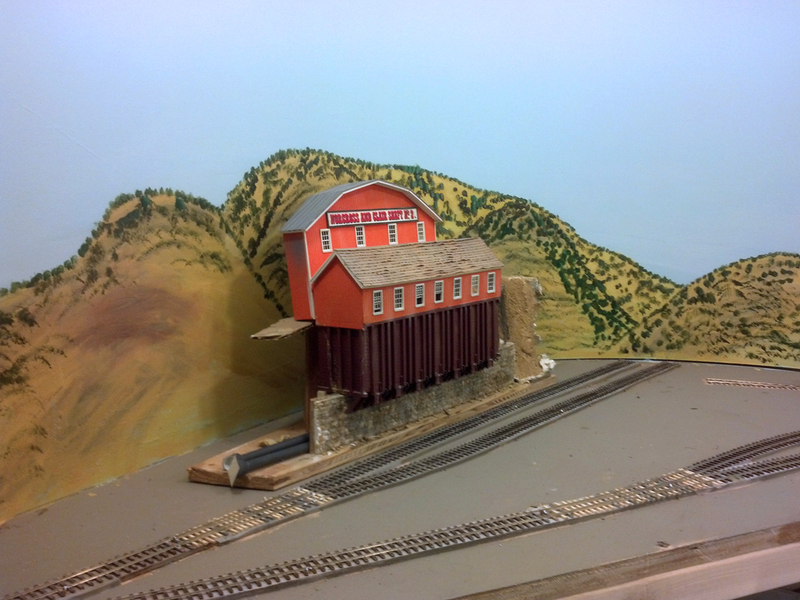 The mine structure used to represent a silver mine on my previous layout and it will be repurposed into the needed coal mine including a new "Amador Coal" sign. 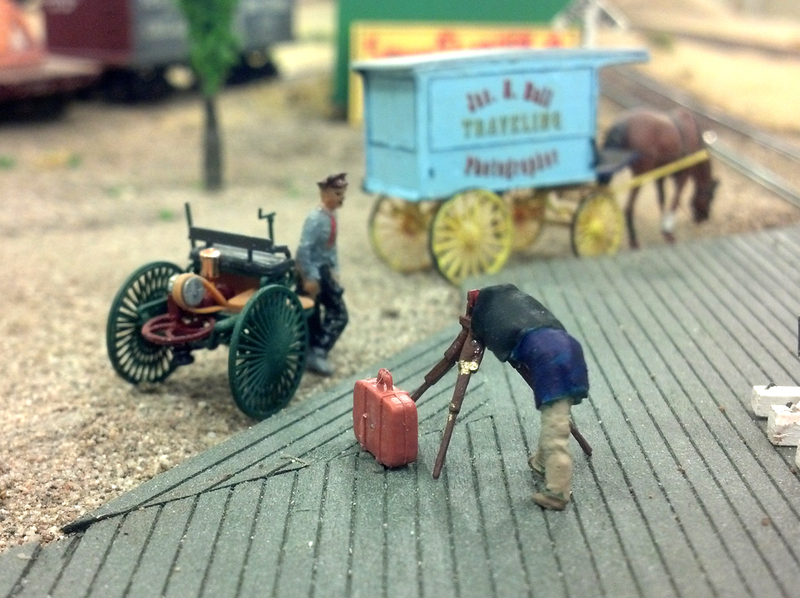 The small depot was at Forbes Crossing on the old layout as well and the town may or may not be renamed as well. 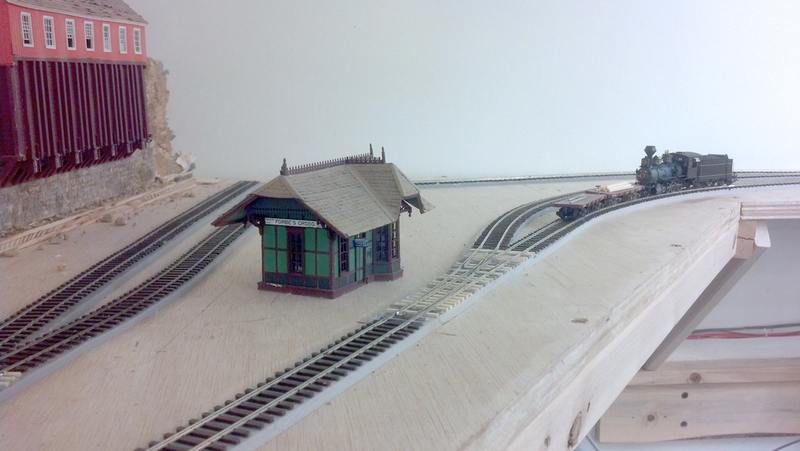 When I started this project, I did not think that many of the old buildings would be usable on this railroad but, so far, I have managed to reuse several of them much to my enjoyment. The track construction is the same as on the main railroad, foam insulating tape with flex track glued to it with silicon caulk. Code 55 is used for the main lines and code 40 for the sidings. 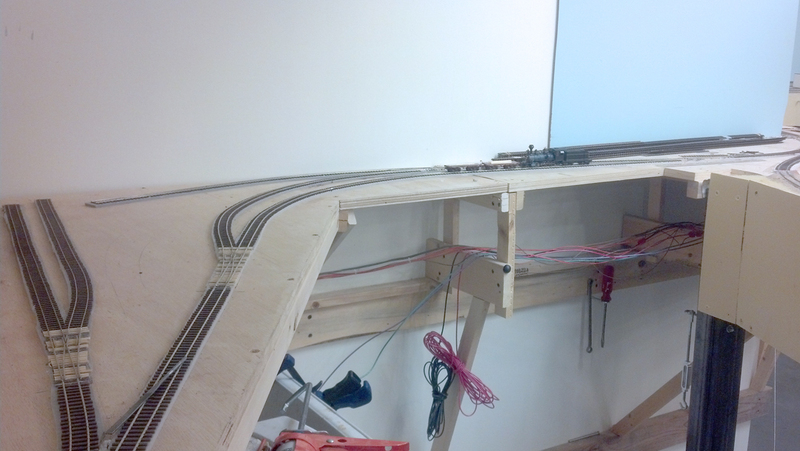 The turnouts are all code 55 built from Fast Tracks jigs. The traveling photographer disembarked from the noon Peters train to capture the image of an 1887 Benz newly-arrived in the neighborhood. Like most photographers, Mr. Ball uses an 8x10 inch wet-plate camera on which to capture his images. 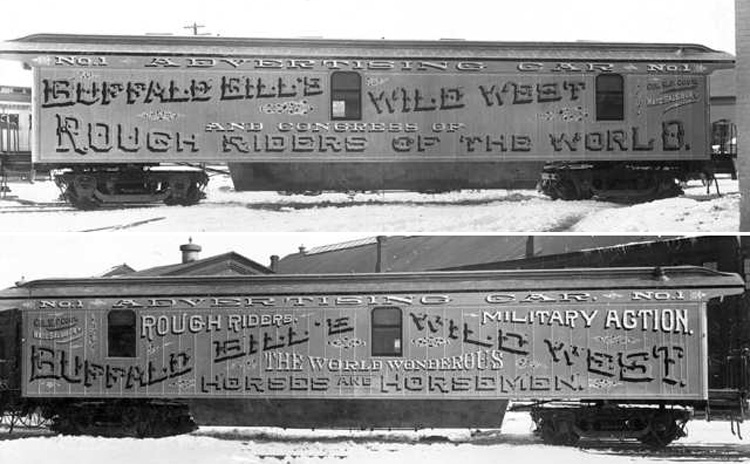 These plates must be developed in the photographer's wagon within a few minutes following their exposure. 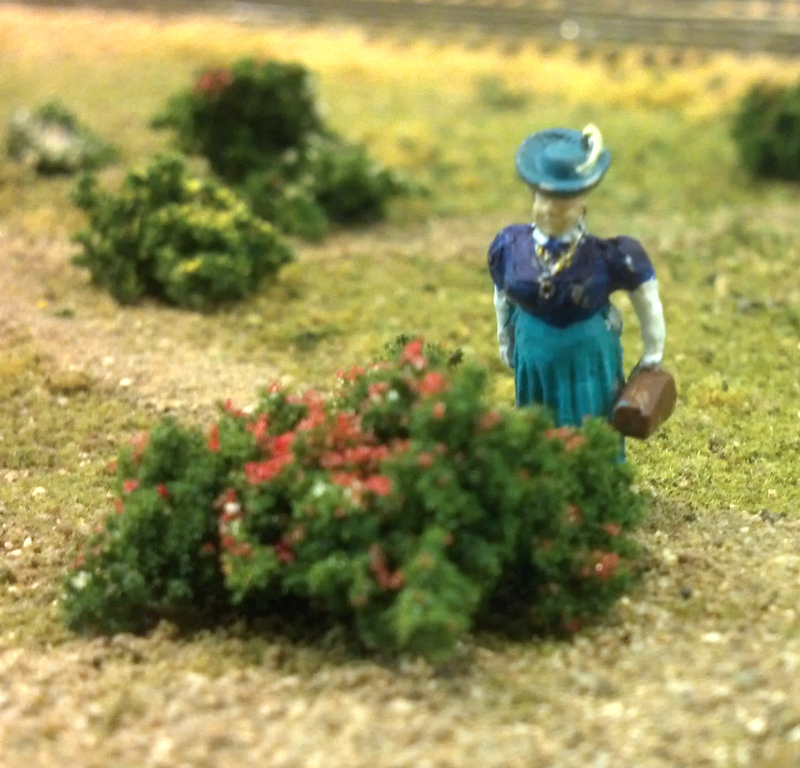 On another note, I finished painting a couple of small figures so I put them to use on the railroad. 7 years old. It was her first foray into figure painting. It's lunchtime and, before making his deliveries, one of the workers decides to entertain his friends on someone else's piano.